Child safety is, of course, a priority in any home. Most of us are well educated on how to keep our children safe in our homes but what about the garage? A garage door is widely convenient for security, however, garage doors are made up of various mechanisms and components which work perfectly in day to day life. We do however need to be clued up on how to keep our children safe around the garage and the garage doors. If you want more information on child safety around garage doors enquire on our website today. It sounds obvious but simply keeping the remote out of reach from your children is an easy way to ensure they are safe. If you keep the remote more than 5 feet off the floor at all times there is less chance of your child reaching or climbing towards the remote control for the garage door. Always, always test to see if your door is working. Maintenance is key in situations like this. Most garage doors nowadays are equipped with an auto-reverse function which keeps the door from closing if something or someone gets in the way. Sensors are usually placed at the bottom of the door to detect small children and pets. Keeping the garage door closed and locked while not in use is key to child safety. If it is closed it reduces the risk of falling and trapping fingers. We all know that children can make a game out of anything! If you seal the door panel gaps with rubber this will prevent children from putting their tiny fingers in the gaps. You can get the rubber professionally fitted to protect your children. When it comes to your child’s safety it’s better not to cut corners. DIY can be extremely satisfying and very rewarding but garage doors are very heavy home appliances and can cause harm if fitted incorrectly. Garage Door Rescue will make sure your door is secure and family friendly. They always have spare parts and are able to fix a problem the same day if needed. 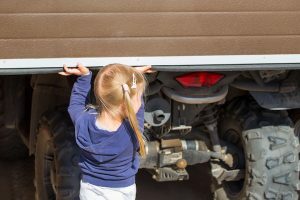 Educating your children about how to use the garage door and how to be safe around it is so important. Without this knowledge, your children could end up hurting themselves or start playing on it. If you talk to your children and explain the garage door isn’t a toy they will be educated and aware of the dangers. Setting up regular maintenance appointments one or twice a year will help to make the most out of your garage door. Your maintenance check will take care of a few things such as; Safety features test, balance test, alignment test, visual inspection test, lubrication test and many more. Maintenance will ensure that problems are solved quickly and efficiently without the risk of getting worse. This will also reduce the risk of accidents and it will also help to reduce costs in the long run. Garage doors include features that advertise child safety. The safety features are required by law, however, it is your responsibility to check these. Your garage door should have an auto-reverse function as mentioned above. You can test this by rolling paper towel underneath the garage door to test if it will reverse. If it does not your door is not working and it is probably best to bring in the professionals who will test your door and repair it where necessary. By following these tips your children will be safe and sound. You can let your little ones wander around the house with ease. 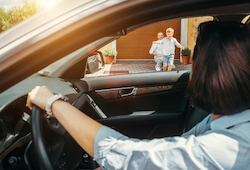 Of course, accidents can still happen but when you and your family are educated on the dangers and how to avoid them, accidents are less likely to occur. If you would like a maintenance check on your garage door or simply want to talk to us about how to keep your children safe don’t hesitate to call Garage Door Rescue today. We offer all of these services and would be more than happy to help. Call us now on 01793393503.